Habit: Shrub. Stem: generally several from base. Leaf: simple, alternate or opposite, sessile or petioled. Inflorescence: heads radiate, 1 or in few-headed cyme-like clusters; peduncles long or short; involucre hemispheric or bell-shaped; phyllaries in 2--3 series, generally unequal; receptacle convex, paleate; paleae entire or 3-lobed, folded around fruits. Ray Flower: 8--15, sterile; corolla yellow; ray entire to 3-lobed. Disk Flower: many; corolla yellow or orange; anther tips triangular; style tips triangular. Fruit: +- flattened, obovate, +- strigose, brown to black; pappus of scales, generally 2 longer, +- lanceolate, (0)2--6 shorter, readily-deciduous. Species In Genus: 12 species: southwestern United States, northwestern Mexico. Etymology: (Greek: like Bahia, an Asteraceae genus) Note: Bahiopsis tomentosa (A. Gray) E.E. Schill. & Panero collected twice in southern SCo in early 1900s, probably an escape from cultivation. Unabridged Note: The two early California collections of Bahiopsis tomentosa (A. Gray) E.E. Schill. & Panero [not included in TJM (1993)] were from San Diego Co. Their status as escapes from cultivation is based on a 1933 annotation by SF Blake w/ref. to Zoe 5:260. [San Diego, 14Apr1906, M.E. Jones s.n., POM; slope near La Jolla, 300 ft., Sep 1919, M.E. Spencer 1644, POM]. Bahiopsis tomentosa is otherwise known from Baja California Sur. Habit: Plant <= 2 m diam, short-rough-hairy throughout. Stem: 6--13 dm, much-branched. Leaf: proximal opposite, distal alternate; petiole 2--8 mm; blade generally 1--3.5 cm, triangular-ovate, 3-veined from obtuse to truncate or +- cordate base, tip obtuse to acute, margin entire or often few-toothed, faces green to lightly canescent. Inflorescence: heads 1 or in open, few-headed cyme-like clusters; peduncle 3--15 cm, slender, bracts 0 or few and leaf-like; involucre 10--13 mm diam, hemispheric or appearing disk-like when pressed; phyllaries equal or unequal, 3--9 mm, lance-oblong, green to canescent, tips abruptly narrowed; paleae 5--6 mm. Ray Flower: 8--15; ray 1--1.5 cm. Disk Flower: corolla 3.5--5 mm. 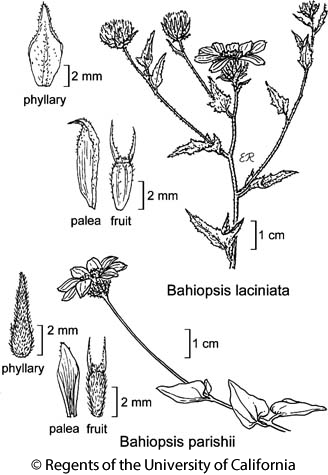 Fruit: 2.7--3.8 mm; long pappus scales 2--3 mm, short scales 0.5--1 mm. Chromosomes: 2n=36. Citation for this treatment: David J. Keil 2012, Bahiopsis parishii, in Jepson Flora Project (eds.) Jepson eFlora, http://ucjeps.berkeley.edu/eflora/eflora_display.php?tid=82217, accessed on April 21, 2019.